Did you know that you can customize PND applications you run by creating bash scripts which run before and after the application? 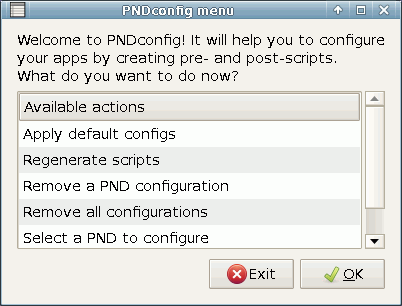 PNDconfig is supposed to make this powerful config option user-friendly. 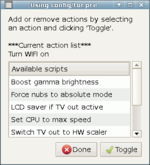 You can configure pre- and post-scripts by selecting actions to be performed from a list. To get you started, I share configurations which I use on my Pandora. You can quickly apply those to your PNDs and see the results. Then you can customize the configuration of each PND to suit your needs. This is a beta which adds several untested features (like increasing battery charge current, spoofing MAC address of wifi module and removing orhpaned appdata entries), however, I feel I should release it now because it fixes several critical bugs. Seriously, the old version had the pre/post scripts executed when you open PND docs instead of applications, and would overvrite scripts in similarly named appdata folders (like tor and torcs), yet nobody complained in months! Do you people use it at all, or do you download it just because it's small and kinda cool to have? Note: when you upgrade, PNDconfig keeps all your configurations intact. 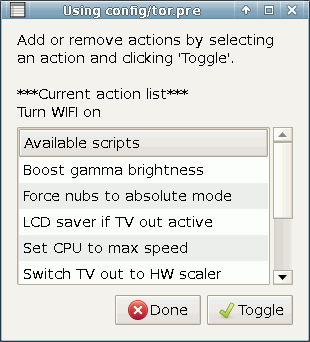 As more action scripts are included with each release, default configurations are updated to include them. To see these updates, you should "Remove all PND configs", and then "Apply default configs". Your changes to default settings will however be lost. The changelog would not fit in the description, so it is maintained in the first post of the forum thread. Dimag0g can you confirm what changed in the latest version ? It would be nice to have a changelog on the repo every time.